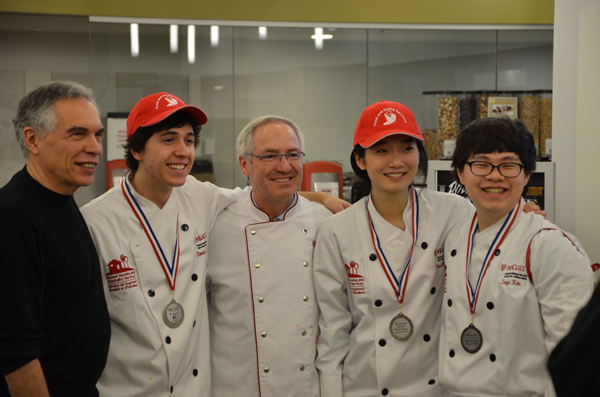 On Feb. 8, McGill hosted the first-ever inter-university Iron Chef competition, where teams of one staff and three students from UMASS, the University of Toronto, the University of Ottawa and McGill cooked their hearts out to impress celebrity judges Jonathan Garnier of La Guilde culinaire, Juliette Brun of Juliette & Chocolat and Dr.Joe Schwarcz of McGill. In the end, the Massachusetts’ team took home gold with a Pearl Jade Rice “Croquette” with Apple Mango Slaw, Fair Trade Black Pepper Sour Cream Emulsion, and Chive Oil vegetarian starter, an entrée of Puffed Quinoa Crusted duBreton Natural Pork Loin with Maple Balsamic Gastrique, Spiced Sweet Potato Hash and Grilled Asparagus and a Garden Vegetable Tofu Strudel with Charred Tomato Coulis dessert. Use an electric mixer with a pasta dough hook. In the large bowl, combine flour and salt. Add in eggs, one at the time, and continue to mix. Drizzle in the olive oil, and gradually incorporate all the semolina until the dough forms a ball. On a flat surface, sprinkle some flour and knead and fold the dough until it becomes elastic and smooth. Wrap in plastic film and let rest in fridge for 30 minutes. In a large skillet on medium high heat, heat olive oil and sautee mushrooms and onions. Once the onions have softened, remove from heat and stir in feta, herbs, salt and pepper to taste. Set aside while preparing raviolis. Preheat oven to 375. Line a baking sheet with parchment paper and place peppers. Cook for 20 minutes, remove from oven and place inside a plastic bag or closed container to let them continue to cook and cool. Once cooled, remove the skin and the heart, and be sure to reserve the cooking juices. Blend skinned peppers and juices until you obtain a velvety texture. Add in maple syrup, thyme leaves and season to taste. In a medium size skillet, heat olive oil. Sautee garlic and cherry tomatoes until they soften. Deglaze with white balsamic vinegar, add in chives and season to taste. Cut the ball of dough in 1/2, and reserve half in plastic film to prevent it from drying out. Dust the counter and dough with a little flour. Press the dough into a rectangle and roll it through a pasta machine, 2 or 3 times, at widest setting. Pass the dough through, continuing to tighten until the machine is at the narrowest setting; the dough should be about 1/8-inch thick. Sprinkle with flour. Beat 1 egg with 1 tablespoon of water to make an egg wash. Sprinkle the counter and dough with flour, lay out the long sheet of pasta, and brush the top surface with the egg wash. Drop a table spoon of the filling on 1/2 of the pasta sheet, about 2-inches apart. Fold the other 1/2 over the filling like a blanket. With fingers, gently press out air pockets around each mound of filling. Use a sharp knife, cut into squares and press the 4 edges together with your fingers. Dust the ravioli and a sheet pan with flour to prevent the pasta from sticking and lay them out to dry. Cook the ravioli in plenty of boiling salted water until they float to the top. Lift the ravioli from water using a straining spoon. Pour coulis over pasta and garnish with cherry tomatoes. Enjoy!